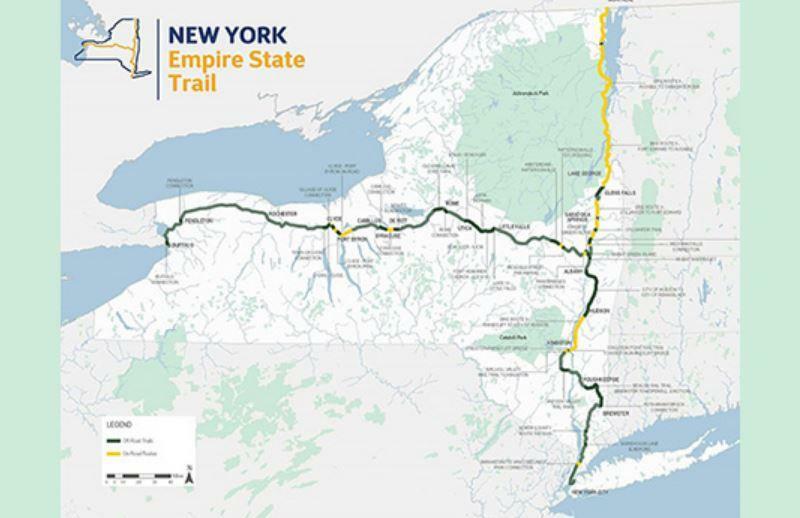 The Empire State Trail is projected to be completed by 2020. Supporters of multiuse trails went to Albany on Monday known as Trail Advocacy Day. They advocated for legislation that would fund and support a statewide plan to improve and extend it. Multi-use trail advocates are hoping to secure funding before the state budget is finalized April 1st. The intention is to complete the Empire State Trail on track for completion by 2020. Project coordinator for Parks and Trails New York Dylan Carey said that outdoor recreation is one of the biggest industries in the state. “Once you’ve got that fully connected Empire State Trail reaching from New York City to Canada and from Albany to Buffalo, you’re going to see even more benefit to local economies, more people coming from around the country and around the world to use this trail, to spend their money here, and to benefit out local taxes,” Carey said. Carey pointed to a 2014 economic impact study that concluded the Erie Canal trail generates $253 million in revenue and creates over 300 jobs annually. “Every million dollars spent on greenways and similar active transportation investments creates 17 jobs as opposed to highways, bridges, things like that that have lower return on their investments,” Carey said. The future hope for the trail is to assess where else funding needs to be invested for the trails and then secure funding through legislation for a multiuse trail plan across the state. Advocates also pulled for an extension to Long Island. The State DOT on Thursday presented new plans for the leg of the massive Empire State Trail that will run through DeWitt and the eastern part of Syracuse. Preliminary drawings were unveiled at an open house held Thursday evening at DeWitt town hall. Sam Gordon, Director of Planning and Zoning, says the plan focuses on a four mile section of Erie Boulevard East.